For the past few weeks we have been reviewing a set of history books from Memoria Press. 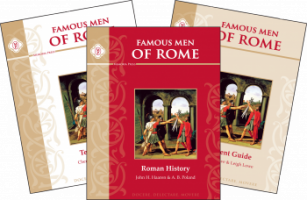 Their Famous Men of Rome curriculum is a study of over thirty famous men or groups on men during the Roman Empire. The Teachers Guide includes all of the workbook (student guide) answer keys. There is a small introduction telling six points on how to use the guide. Also included are all the student test and test answer keys. This book is solid bound and 172 pages. The Student Guide has worksheets for each of the chapters. Every fifth chapter there is a review which includes additional work for the previous five chapters. (After completing the review your student would take the test.) This book is soft and bound and 120 pages. The worksheets follow the same format for each of the regular chapters - Facts to Know, Vocabulary, Comprehension Questions and Activities. Next, is the Text Guide. This is what the student reads for text. It includes colorful pictures and illustrations for the stories enclosed. Each chapter is only a few pages and students can read this easily. There is a glossary and some maps at the end of the book to go with the lessons. It is soft bound and 157 pages. My middle son is just finishing up his 7th grade year. Since this course is recommended for grades 4-8 I thought it would be a great fit - and it was. He was able to read the text and do the workbook pages completely independently. The only thing I modified for him was the Activities. Each chapter had a different amount of additional activities to do so I just circled the ones I wanted him to complete. I did have a suggestion for the Teacher's Guide. The student test are in the teacher guide and it is completely bound. Either you have to rip them out (no perforation) or have the student do them in the teacher's guide with all the answers right there. (The test answer key is the very next page!) What we did was put construction paper in the book for the start and finish of the test and trust my son not to cheat... I would have loved an option to print test out or tear them out easily - or perhaps have them at the end of the Student Guide. My other suggestion is a grading key for the test. I feel like the essay should be worth more than fill in the blank. It would be nice if the test key told you how to weigh them. 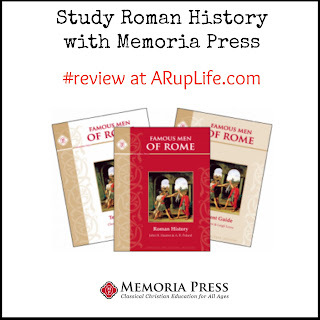 The Book of the Ancient Romans Set which is for grades 6-12 as a next step for history. Hellⲟ! I јust wish to offer ʏߋu a һuge thumbs up fօr the ցreat informatiߋn ʏߋu have right heｒe on thіs post. I'll be returning to your web site f᧐r more soon.